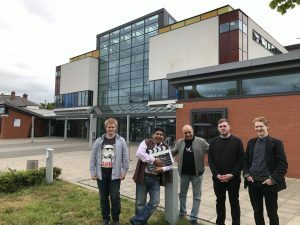 Studio 4 4, an international film company based at the Beacon, are continuing to grow their business by taking on three apprentices through the training agency, Creative Generation. The three apprentices will be working to support TJ Gill and Doc Anand, the directors of the business, as they look to diversify into new areas of media. For instance, Luke Crosby, 19, from Chester-le-Street, will be working on Studio 44’s new digital marketing project GOGO. Also joining the team is Chad Amers-Clarke, 19, from Wallsend. Chad will be focussing mainly on the filming and editing of content. The Beacon wishes Luke, Chad and Ethan the best of luck in their new roles at Studio 44. Doc Anand and TJ are in Cannes this week for the Cannes Film Festival so make sure you continue to follow our feeds for updates on what they’re up to.